The month of April’s spending was a bit more complicated than March’s. I made three trips to the office for the SOJO and for HIV Boot Camp preparations, which cost me a lot of emalangeni that are not reflected on this sheet because I would be reimbursed for the travel, hostel, and some food costs. With those expenses, plus another E500 in tutor costs that are also reimburseable, I was out more than E1000. This is a monthly occurrence that causes me some stress because I am already trying to live on a small amount of money, and compound that with spending one-third of that stipend up front on reimburseable activities, and it creates a bit of a bind. In April, I also went on vacation in Mozambique where I spent plenty of money on food and fabric and other touristy activities. 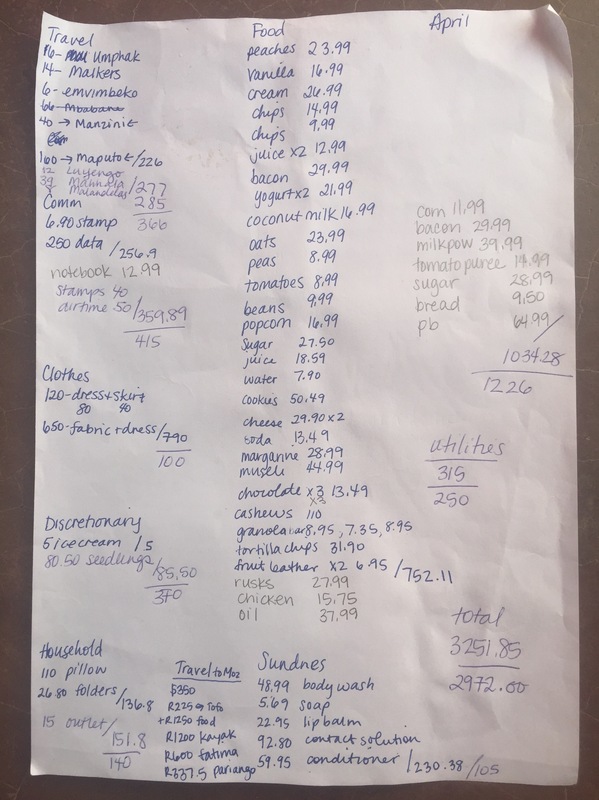 I fit what expenses I could into my monthly totals, but still have a separate travel section. This entry was posted in Africa, Peace Corps, Swaziland and tagged Africa, Money, PCV, Peace Corps, Peace Corps Volunteer, Swaziland. Bookmark the permalink. I loved it! The sea food was glorious, as was everything else I ate, and the landscape was beautiful. Plus, the men didn’t harass me like in Swaziland! Oh my! You got harassed? I’m so sorry to hear that! Does it still happen though? Ugh!